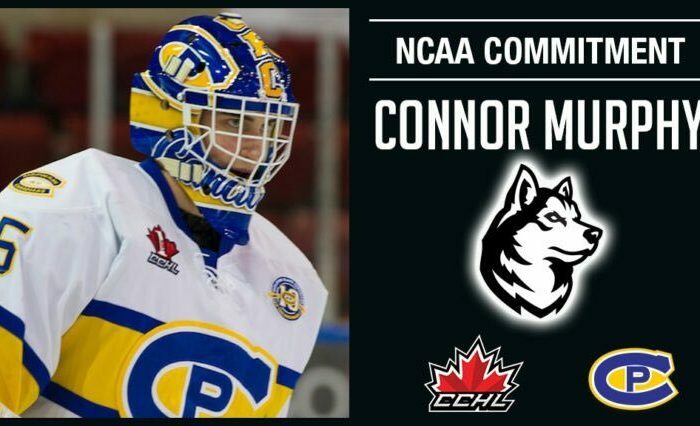 On Thursday night the Northeastern Huskies took on their canine brethren in Hartford CT, and fell to the Connecticut Huskies 3-2 in overtime. Alexander Payusov scored just over a minute into the extra period after a Jordan Harris turnover in the Northeastern zone, capping off a comeback that also featured UConn scoring an extra attacker goal with under two minutes left in the game to tie the score at 2. Overall, Northeastern outshot UConn 33-32, but were outshot 3-0 in overtime. UConn struck first in the opening frame when a Roman Kinal pass was partially stopped by Julian Kislin, but the puck had enough momentum to get through him and it sat in open ice just out of Cayden Primeau‘s reach. UConn freshman Jachym Kondelik scooped up the loose puck and roofed it over Primeau, who had gone prone in an attempt to track it. An unlucky bounce for Northeastern. The good Huskies would come back with one goal each in the second and third periods to take a 2-1 lead. The second period tally came on the powerplay, when Jeremy Davies entered the zone on a rush and drew two UConn defenders to him near the half boards. 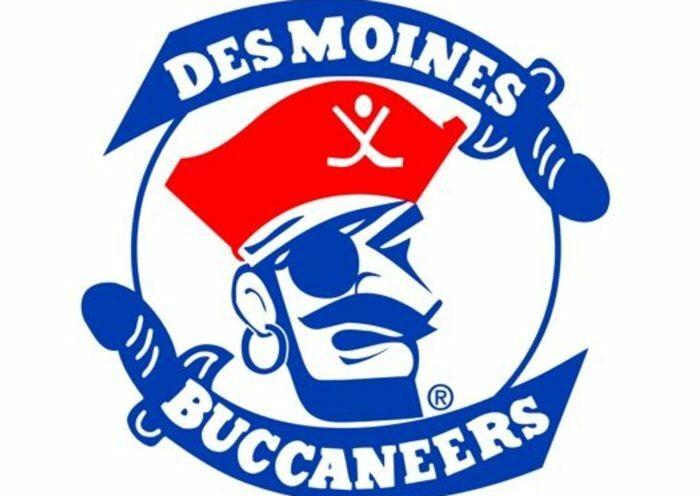 Davies fed an open Zach Solow near the goal line, who rushed the net and waited out goaltender Tomas Vomacka before tucking it between his pads to tie the game. WATCH: UConn's scouting report said that Jeremy Davies is good at hockey. In the third period, the Huskies took their lead on a beautiful play by Grant Jozefek, who collected a loose puck in the neutral zone and made a move to go behind the net of Vomacka. Only he didn’t take the puck with him, he dropped it into the slot for a crashing Eric Williams, who deposited it into the vacated side of the net. It was one of the prettier plays I can remember this season from Northeastern, and a flash of the passing skill Jozefek has shown since he arrived on Huntington Avenue. His first point since January 12th against Maine, hopefully this can be a spark to ignite Jozefek’s offense for the stretch run. UConn struggled much of the game to find any offensive zone presence, but the final five minutes of the game, they seemed cemented to the Northeastern end of the ice. This was eventually rewarded with under two minutes remaining, when sustained pressure and patience by Ruslan Ishakov led to a uncontested shot on net, and a tip in front by Brian Rigali to tie the game at two. In a defensive lapse, the Huskies’ defenders were drawn out from the goal to challenge the UConn skaters around the center of the zone, leaving two UConn players unmatched and unchallenged in front of Primeau for the tip (watch below). In my opinion, there is no reason for two black jerseys to corral around the one white on between the dots, particularly when that setup leaves more men open. These kinds of lapses have not been rare for the Northeastern Huskies, and will need to be corrected before heading into the stretch run. 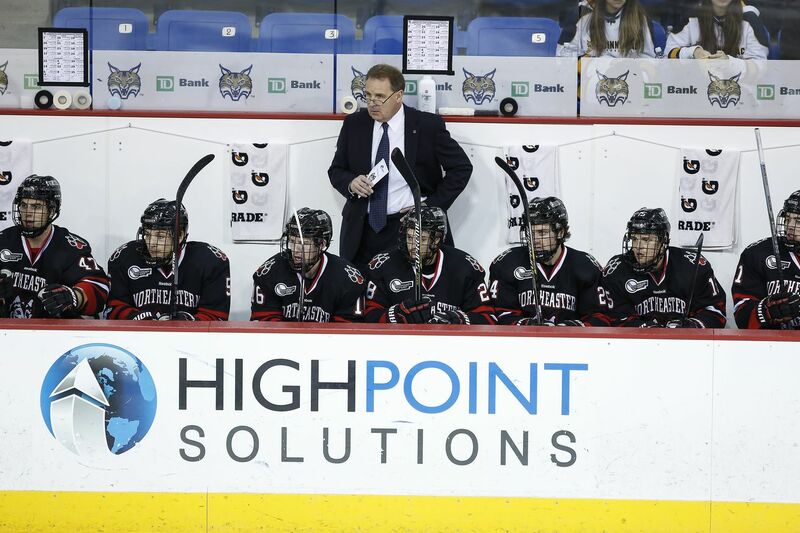 The loss was a big hit for Northeastern’s chances to maintain home ice for the Hockey East playoffs and their chances for an at-large bid in the NCA Tournament. As we go into the Beanpot final, Northeastern sits in tied for fifth place in the conference with a surging New Hampshire team, one point behind Providence (a matchup nightmare for NU). 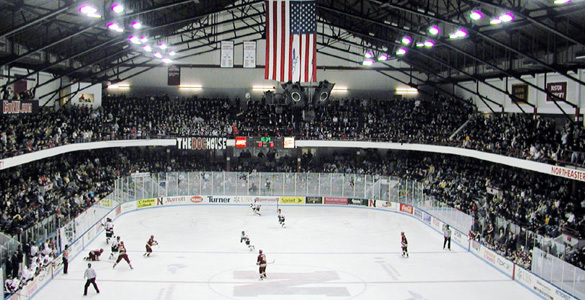 They are only two points ahead of eighth-place Maine, and while Vermont sits in ninth place at twelve points and that seems unlikely at this point, the Huskies will need to play as well as they showed against BU in the Beanpot to fight off their competing schools for these valuable playoff spots. While they are only two spots out of eighth place, they are also only two spots behind third place and home ice, with at least one game in hand against Providence, UNH, and Maine. Their final conference games come against Vermont (9th place), New Hampshire, and Boston College, so the Huskies have an excellent chance to make up for lost time against very beatable teams. But they have almost run out of mulligans, and need to bank as many points as they can in this stretch run. The Huskies are in action tomorrow night against Boston College for the Beanpot final. We will have a preview of BC coming later tonight. See you at the Garden. If you can’t make it, the game can be watched on NESN and TSN for our friends watching in Canada.